My kitchen sink containing all my random thoughts. On a certain weekend morning, FBB wanted to paint. That is usually not a problem in and of itself. He paints frequent enough in school and at home, and he knows what to and not to do with paints. Except this time, BBM is also around. And she has never painted before. 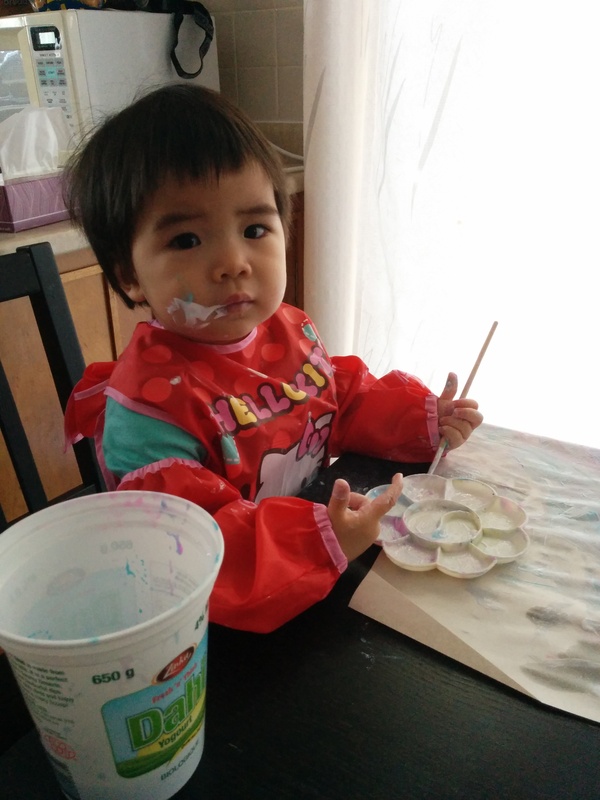 I put the 3-sizes-too-big Hello Kitty art smock (gift–don’t ask) on her, made sure FBB put on his own smock, set out the paints, brushes, and paper, and went on to do the dishes. Paint on the face! 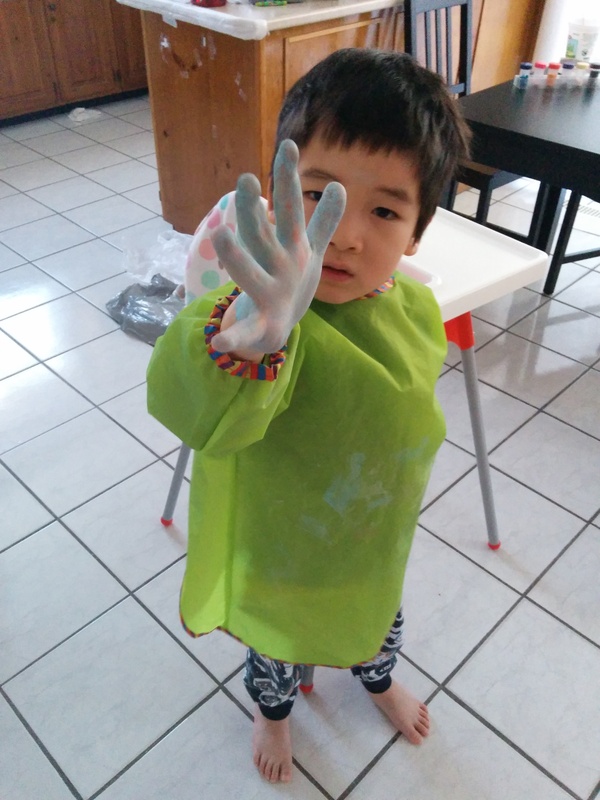 Thank goodness for non-toxic, water-soluble tempera paint! He can wash his own hand, thankyouverymuch. I bought some fancy duct tape, wanting to make crafts with FBB. I was not happy with the way he stores paper bills in his (coin) bank, and the hand-me-down wallets he has received thus far are too… classic (read: old) for a 5-year-old. 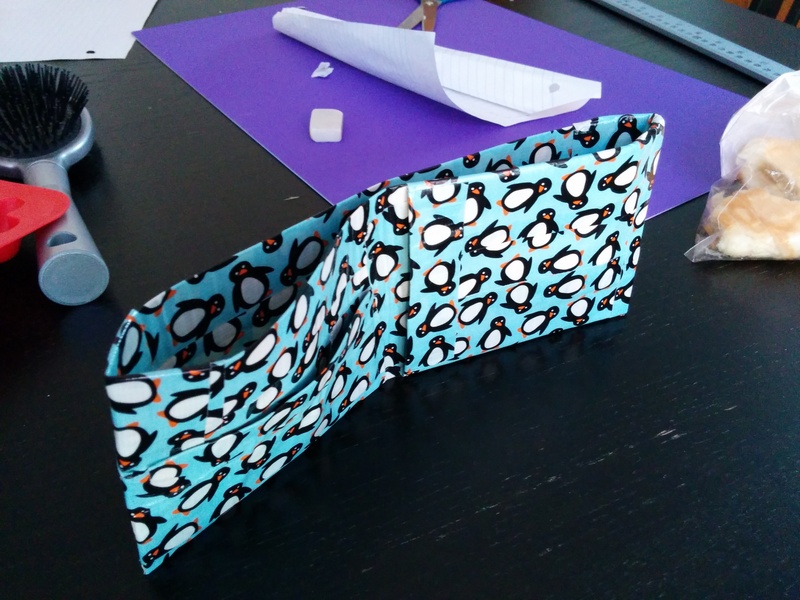 So, one Saturday afternoon, I decided to make a duct tape wallet with him. Truth to be told, it was mostly my work. He got bored by the precision required rather quickly. 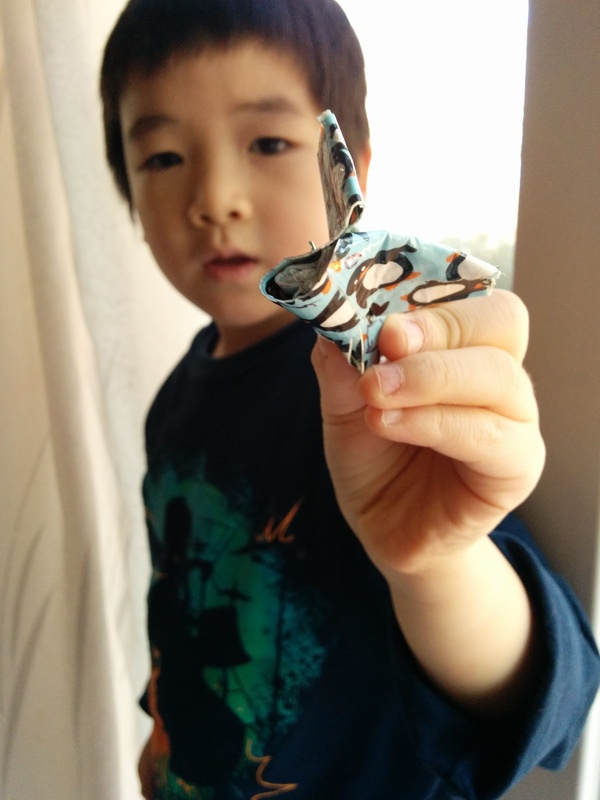 Instead, he used the scraps and made his own craft. Combine, heat over medium-low heat, stir until consistency of mashed potatoes. Transfer to mixing bowl, covered with dampened kitchen towel to cool. Sprinkle cornstarch on surface and knead in food colouring. The recipe doesn’t seem to keep as well as the regular playdough though, so I won’t send this in to school the next time it’s our turn. I’m pretty sure it’ll come in handy in the next–oh, 10 years or so–time we need a cheap air-dry clay. A few weeks ago, FBB came home with a teacher’s request to make playdough for their class. (Understandably, with so many kids, they want fresh playdough every week.) I signed up, and today was our turn to provide the weekly playdough supply. This is a no-cooking recipe. Just combine everything except the food colouring in a mixing bowl, then knead in the food colouring. If I were to make this again, I would switch from cold water to warm/hot water. I would also switch from using food colouring drops to Wilton cake dyes for more intense colours–I used at least 15 drops of red and it was still a long way from the intensity I wanted. Since FBB’s play dough have long since dried out, he wanted to save some of the fresh dough at home. 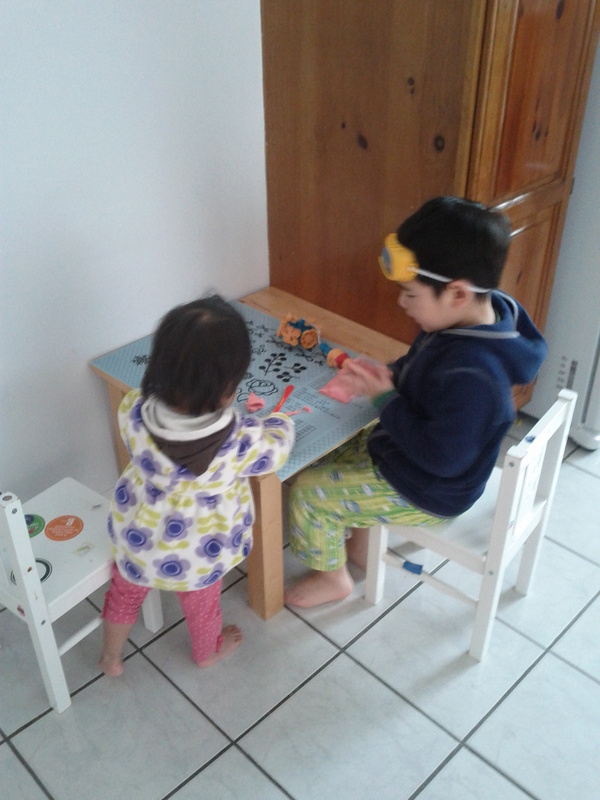 To keep the kids (or at least BBM) away from the stove, I set up a playdough playing station with our silicone mat and let them play with the still-warm-to-touch playdough. Mix water, salt, cream of tartar, and food colouring. [Note: I still prefer to add food colouring at the end, just because I want to make smaller batches of different colours instead of one big batch of a single colour.] Cook mixture over medium-low heat, stirring regularly until hot. Add oil. Stir in flour one cup at a time, stirring in between each addition. [Note: I’m sure this technique gives better consistency.] Mix until playdough pulls away from pan and is no longer sticky (pinch it between fingers to test). Let cool on counter, then knead. I followed the instructions on My Boho Baby is Hippie Chic and made this high chair/shopping cart cover. 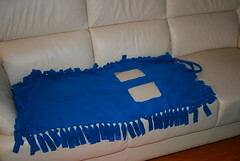 If this works well, I might make another one for gifting. I bought some Heat ‘n Bond and some felt for some custom applique too, though I’m not sure whether fleece is a good fabric to try it on.